The Toughest, and Cutest, Mammal? Last week, I posted about the tardigrade, a microscopic creature that is one of the toughest on earth, reviving after years of being frozen or dried. But what about mammals? Could we do anything similar in order to live longer or induce a life-saving hibernation for cryogenic freezing? I started to research the toughest mammals and found that once species lives right here in Alaska, the Arctic ground squirrel. In Fairbanks we are nearing the end of winter, but the snow won’t melt until April. The red squirrels in my backyard live on spruce cones and seeds from my bird feeder, but farther north and at higher altitudes, Arctic ground squirrels have a different survival strategy. They hibernate in dens beneath the snow for almost 7 months. They go from a summer body temperature of 99 degrees F and dip just below the freezing point of water while hibernating. Why do they stay alive? Every two to three weeks the animals start to shiver, or they metabolize some of their stored body fat in order to bring their temperatures up for one to two days before dropping back into hibernation. 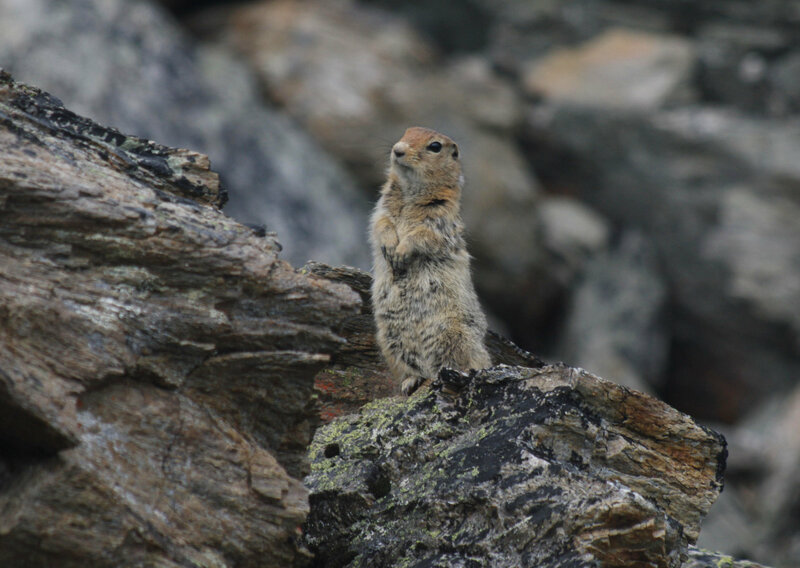 Arctic ground squirrels often leave their dens in the spring with half the body weight they gained, but they are perfectly healthy. Such an ability to survive would be great for space travel or cryogenic freezing, but a more wide-spread and practical use could come from our frozen furry friends. As you might expect during the weeks their metabolisms are reduced down to a third of their normal level, their brains shrivel and connections between neurons die off. When the squirrels go through their warming phase, however, they grow even more neural connections than they had before hibernation. When they finally emerge after winter with their still-healthy brains, the extra neural connections are pruned, much like in the developing human brain after birth. If we determine what helps the brains of hibernating animals recover so fully, we might have a treatment for Alzheimer’s or other degenerative brain diseases. Even now, the brains of hibernating animals are starting to reveal the role of protiens that scientist were not sure if they were helpful or harmful to degenerating brains or if they were just symptoms of the problem. I’ll let you read the article below for more information. Once we discover how to fix the brains of the un-frozen, maybe we can turn our attention to freezing people. ← The Toughest, and Cutest, Life Form?